The narrator, Jim Hawkins, has been asked by a few men, including Squire Trelawney and Dr. Livesey, to write down all the details of their adventure to Treasure Island, beginning sometime in the eighteenth century (though we’re not given the exact year). Jim begins with the setting of the Admiral Benbow inn, owned by his father, where one day an old seaman comes to lodge. The narrator of the novel, we learn, is the same person as the protagonist. But the adult Jim Hawkins has the benefit of hindsight, as he is looking back onto his past adventures and will be able to contemplate what he has learned—as well as foreshadow certain key elements that his younger self could not know. The man is strong and heavy, with long hair and ragged hands: he breaks out now and then into a “sea song,” ending “Yo-ho-ho, and a bottle of rum!” He drinks lots of rum, and tells Jim’s father to call him captain, but doesn’t share details about himself, only asking each day if any seamen had come up the road. The newest guest to the Admiral Benbow inn is somewhat of an enigma: Jim’s father isn’t able to clarify the mysteries of his character to his son, leaving Jim to figure it out on his own. Jim is not as afraid of the captain as others: he sees how often the captain drinks himself into a stupor. Other guests are scared by the captain’s stories about hangings, walking the plank, and other sea adventures. Jim’s father worries that the captain will drive away business, but Jim thinks the fascination he inspires in others is good for them. This is Jim’s first realization of both the power and danger of rum, which so many pirates drink to great excess. Jim is beginning to learn that even frightening characters have their weaknesses and vulnerabilities, and he internalizes this knowledge. For months the captain stays, eventually no longer paying: when Jim’s father asks for payment, he roars and scares him away. Jim’s father’s health begins to decline. Jim’s father doesn’t seem to have the same kind of pluck and quick wit as his son—he is a flat character who doesn’t last long. One day Dr. Livesey stays for a drink after checking on Jim’s father, and grows annoyed at the captain’s sailor songs about a “dead man’s chest.” He tells the captain that he’ll drink himself to death if he keeps up with the rum, and the captain, furious, draws a knife against the doctor. The doctor remains calm, however, and simply tells him to put it away or he’ll be hanged. As a magistrate, he says, he’ll keep his eye out for the captain. Baena, Victoria. 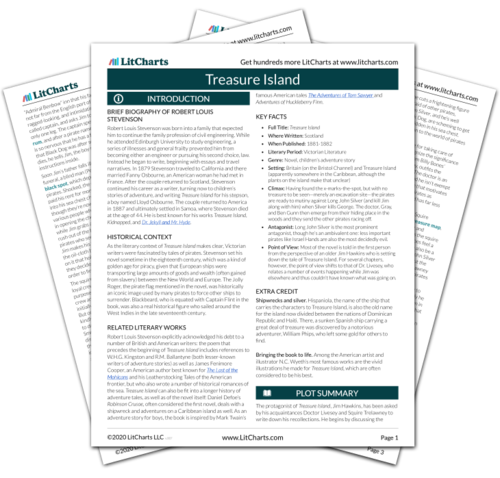 "Treasure Island Chapter 1. The Old Sea Dog at the “Admiral Benbow”." LitCharts. LitCharts LLC, 6 Jan 2017. Web. 22 Apr 2019. Baena, Victoria. "Treasure Island Chapter 1. The Old Sea Dog at the “Admiral Benbow”." LitCharts LLC, January 6, 2017. Retrieved April 22, 2019. https://www.litcharts.com/lit/treasure-island/chapter-1-the-old-sea-dog-at-the-admiral-benbow.